You might also like these Tasty Potato Salad Recipes from Around the World. 1. Steam potatoes in a stovetop steamer for 10-12 minutes, until just tender when pierced with a fork. 2. Place on a baking sheet to cool. 3. Whisk together mayonnaise, relish, dill, mustard, vinegar and salt and pepper. 4. 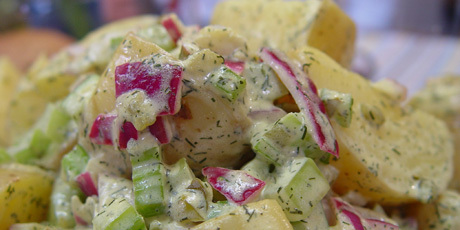 Place cooled potatoes into a large salad bowl and add celery, onion and mayonnaise mixture. 5. Season with salt and pepper and toss well to combine.